All leathers, fabrics, and colors available. Please allow 30 days for delivery on custom orders. Stressless E300 3 Seat Sofa- Enjoy Pain-free Inside Delivery at Unwind. Feel the daily stress disappear when you order a Stressless E300 sofa from The Unwind Company. Is the seat large enough to support your whole body? If it is too small for you, you will notice your shoulders may not be properly support by the back cushion. If your head is too far above the back cushion and you feel as if it isn't adequately supported, then this chair is too small. If the chair is too large, you may notice there is too much space between your legs and the armrests. Also, if your head feels "pushed forward" this may indicate that the chair is too large for you. 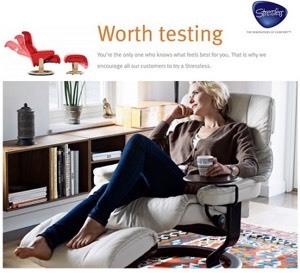 Product Dimensions: W: 98.5" H: 28.75" D: 38.25"
10 Year Warranty from Ekornes. For anyone over 5 feet tall the headrest is required. Unfortunately this option is very expensive if you get it for each of 3 seats. Why not included?